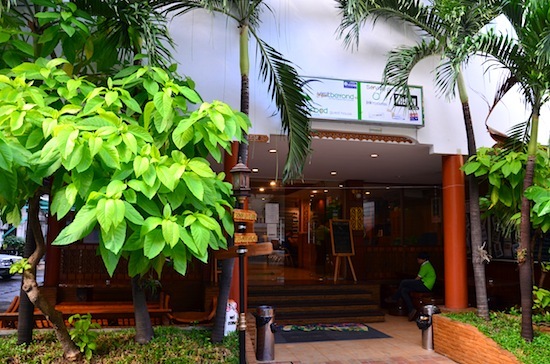 Set in a strategic location between Chinatown and Silom Road, the New Road Guesthouse is a solid choice for backpackers and flashpackers who aren’t into the trendy hostels but don’t want to miss out on a lively traveller scene. Dorms start at 250 baht and the most basic private rooms go for as low as 280 baht, making this one of the cheapest options in a pricey part of town. Ad Book now! Rates from US$19.22++. Average rating 7.6 from 342 reviews. Say hi to the cute dog that likes to laze out here. With 11 different room options spread through two nondescript white concrete buildings down a narrow alley, New Road blurs the line between “hostel” and “guesthouse.” It has the feel of an old-style Thai guesthouse but with many of the common facilities and extras commonly found in hostels, such as a billiards table, hangout terrace with hammocks, free WiFi, free coffee/tea, restaurant and tour desk. It’s a great place for solo travellers to make new friends. The cheapest options are 10-bed mixed or four-bed women-only air-con dorm rooms relying on cramped shared bathrooms. Set up on either side of a long and narrow mixed room with tile floors and a window, each bunk comes with a firm mattress, clean linens and use of a large personal locker. While you don’t get a personal reading lamp or privacy curtain, the price is right for those on a shoestring budget. We liked how the mixed room had a few ceiling-mounted fans to move the cool air around. It also appeared to be as clean as you could expect in one of Bangkok’s cheapest dorm rooms. A 700-baht standard double room. The list of private rooms begins with a 1.6 by 2.5 metre double with a bunk bed, fan and no window — basically a closet for 280 baht a night. Much better are the basic fan-cooled “backpacker rooms” with windows, mini-fridges, seriously tiny bathrooms and classic Thai-style fretted wood adorning the walls. The “standard” rooms are similarly cramped but come with air-con, plus a small TV if you’re willing to pay 150 baht extra. The best rooms are located in the second building, which is quieter and has more breathing room than in the main building. “Superior” rooms come with hardwood floors, generic photos of Thailand on the walls, large windows, desks and a fair amount of space. At the top of the price scale and situated on the upper floors, a family room comes with wrap-around screened windows while a four-person apartment bags you a private balcony, sofa and dining area. New Road is well-suited to Bangkok first-timers. Back in the main building, the ground floor lobby greets you with a fairly helpful staff, a book exchange and a few sofas near the restaurant/bar. 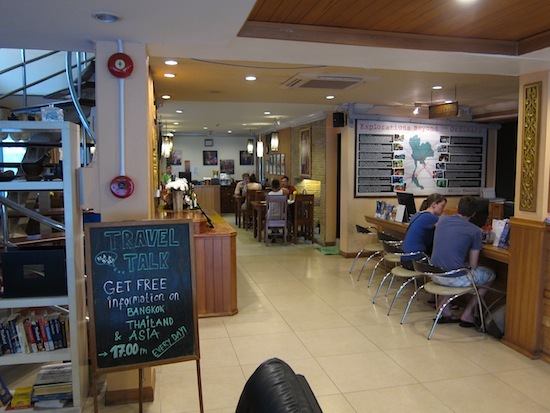 Staffed by a young Westerner when we stopped by, the tour desk offers an extensive menu of experiences ranging from local walking tours for 900 baht per person to bike tours and even multi-day guided trips into other Southeast Asian countries. We stopped by around Halloween to find a “creepy Bangkok” tour available. A spiral staircase takes you up to a lift that starts from the second floor. The top-end rooms are reasonably priced for what you get, though we might opt for a more traditional hotel or B&B, like the nearby Bossotel or Baan Glang Soi, if we had that much cash to spend. Check out FAB Hostel if you’re after something similar to New Road but with a much more attractive building and more space to move around. The entrance off Charoen Krung is easy to miss. While there’s not much of interest within a three-minute walk, a slightly longer stroll will take you to all sorts of options. Just off historic Charoen Krung Road, New Road is within fairly easy striking distance of Huamphong train station, Chinatown, Silom Road and the BTS skytrain at Saphan Taksin station. Street food abounds in several different directions, and you’ll find several good Indian restaurants on nearby Surawong Road. Providing access to Khao San Road and the Ko Rattanakosin historic district, the Chao Phraya express boat can be caught at the nearby Oriental or Sathorn piers. The area also has a fine selection of antique art galleries to explore. At time of writing in December 2015, Google Maps mistakenly places New Road on Charoen Krung Soi 42/1; it’s actually located down an easy-to-miss alley that shoots off the west side of Charoen Krung Road between Soi 34 and Soi 36. Look for a green sign on the left if coming from Saphan Taksin in the south. 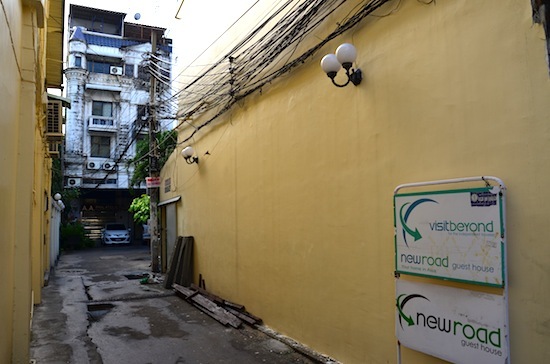 If coming from Hualamphong in the north, look for the first alley on the right after you pass Charoen Krung Soi 34 (the sign is not visible if coming from this way). Check rates at New Road Guest House on Booking.com. 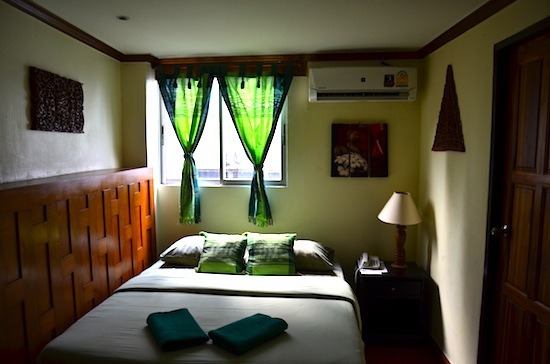 Room: Quad air-con private bathroom, low season: 1,700 baht, high season 1,700 baht. Notes: "Superior quad"